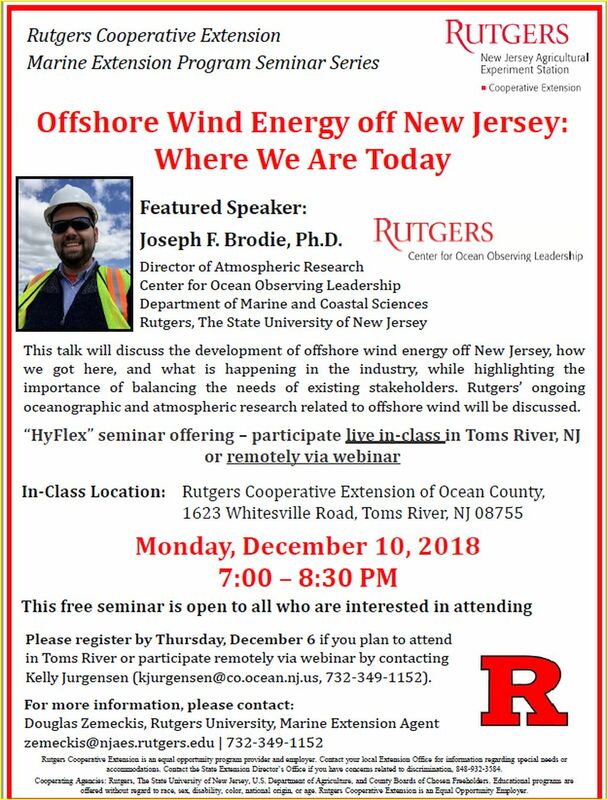 I am sending a reminder about the next seminar as a part of our Marine Extension Program Seminar Series with Rutgers Cooperative Extension, which will be next Monday, December 10 from 7:00-8:30 PM. "Offshore Wind Energy off New Jersey: Where We Are Today". Please see the email below and attached flyer for additional details. Feel free to pass this announcement on to anyone who you think might be interested. If you are interested in participating, either in-class in Toms River, NJ or remotely via webinar, then please register by contacting Kelly Jurgensen (kjurgensen@co.ocean.nj.us, 732-349-1152). Please also feel free to contact me if you have any questions.